I decided to do all the art myself. This is probably a bad idea©. But I really just want to get this published. My couple month project is yet again spanning into half a year. There is no way I can bring an artist on the project and somehow improve the release schedule. There are far from perfect and I could spend ages adjusting them. If I have time an inclination, I will do so later. For now I just want them “good enough” that I won’t stop myself from pushing that “publish” button. Just specify the animation and you’re good to go! 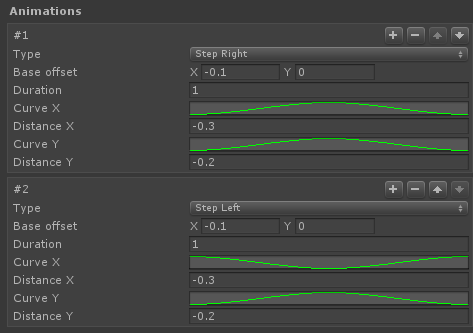 Even that -0.1 offset can live in the main logic. That makes reusing animation incredibly easy. It makes tweaking them much easier, if not individually previewable quickly. Unique animation would take extra time though. Compromises. 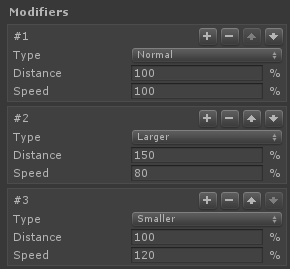 I can specify some modifiers, like larger/smaller (for size) and quicker (for movement) hover and it’s done — I don’t have to mess with curves for any more animators. Anyway, all of this took quite some time over many days even though it compresses into a shorter blog with mostly images.